The largest country equity holding within my portfolio is my home country, the United Kingdom, at 20.4% of total portfolio value. This is then followed by Australian equities at 10.1% (a mistake I've mentioned numerous times previously) and then US equities at a relatively paltry 4.5%. The Equity markets of these three countries make one third of my portfolio and so their performance (particularly that of the UK) matters. My total portfolio year to date is under water by a few percent and since I started my DIY journey to FIRE (financially independent retired early) in late 2007 I've only managed a real (after inflation) annualised 3%. Looking at the data what is clear is that to date I have backed the wrong horse. Let’s take a look. Year to date the S&P500 is down 2.3%. 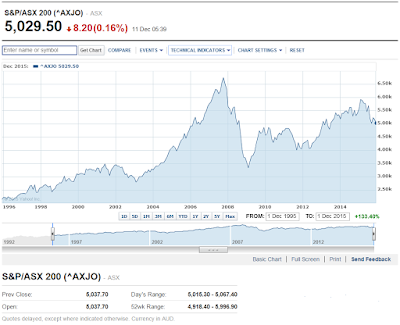 In comparison the FTSE100 is down 9.3% and the ASX200 is down 7.0%. 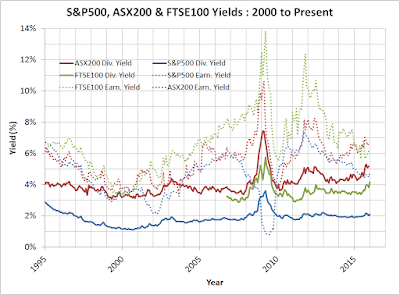 Here I’m finally winning (a little) with the FTSE100’s dividend yield at 4.2% and the ASX200’s dividend yield at 5.3% being more than double that of the S&P500’s 2.1%. 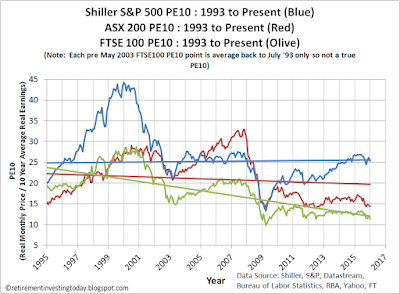 Is the S&P500 simply over valued in relation to the FTSE100/ASX200? Today the S&P500 sits on a CAPE of 25.3. 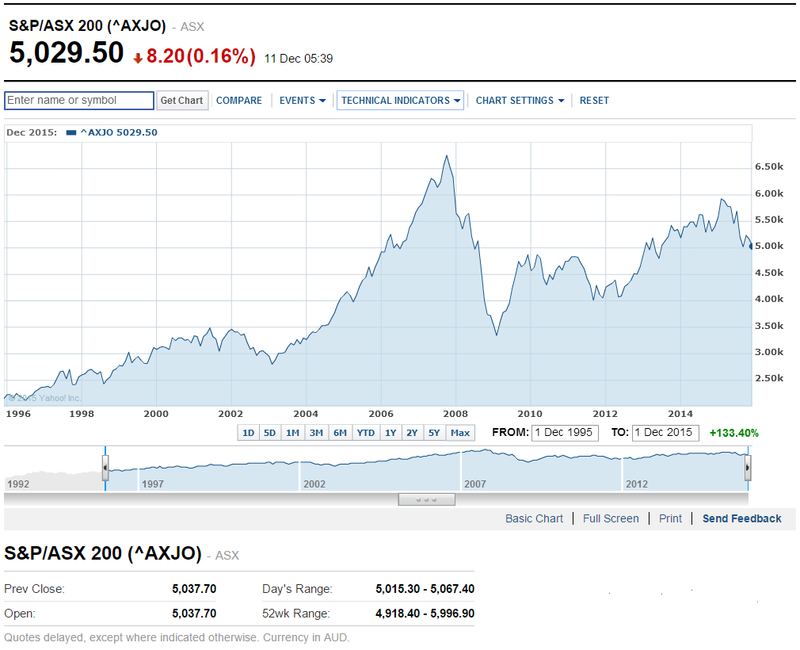 In stark contrast the FTSE 100’s CAPE is 11.3 and the ASX200 is 14.3. If I do a bit of behind the scenes number crunching by calculating dataset long run averages and then extrapolating to common periods those valuations point to the S&P500 today being over valued by 52%! 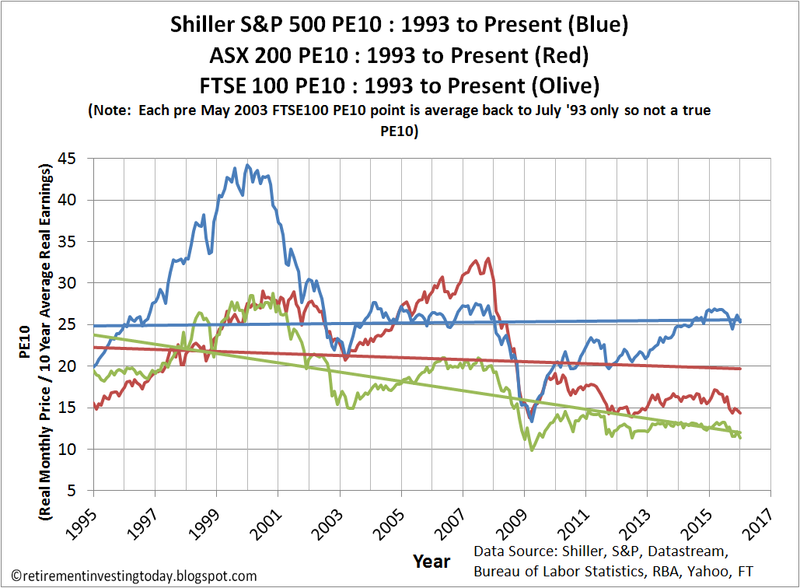 In contrast the ASX200 is overvalued by a much more modest 7% and the FTSE100 is now undervalued by 2%. 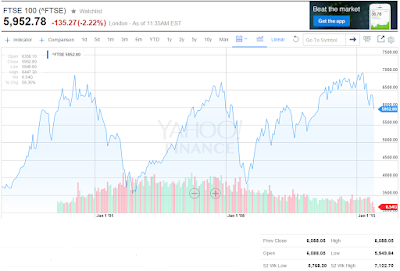 Could the S&P500 be about to underperform the FTSE100 and ASX200? I of course have absolutely no idea as I proved a long time ago that my crystal ball just didn’t work. What do you think? So why the analysis and am I changing horses I here you ask? A long time ago I decided to vary my nominal country allocations by a small amount in relation to these country valuations. That still holds. Otherwise I’m doing absolutely nothing and I’m certainly not about to start backing a different horse. Otherwise I am doing absolutely nothing and I am certainly not about to start backing a different horse. Is the overriding purpose of your investments to grow a large enough pot to fund the rest of your post FIRE life ? As far as I can see the answer to that is yes - except that at some point you are going to need to buy a house ( or even two?? ) - either pre- or post- FIRE. Your planning led you to overweight your investments in Australia - when you were thinking that you would end up living there. Your planning has also lead you to seek income - knowing that your portfolio's income is what you are going to be living off after FIRE. But you do not need income now as you are already managing to invest a significant proportion of your earnings into your investments. I acknowledge the importance and power of re-investing dividends for long term growth - but that re-investment will presumably mostly stop after FIRE as you will be drawing your dividend income and hoping not to be eating into your capital. So - why the emphasis on income NOW? Would it not be more relevant to your purposes now to be aiming at growing your investment fund as much as you can - ie following a GROWTH strategy ? - I don't want to have to sell down capital to eat as I think that could be hard to do psychologically during severe bear market. In FIRE I don't want to even think about these types of things. - I started this journey knowing nothing and I'm still learning everyday. That's one reason I keep blogging. This site includes the good, the bad and the ugly so early mistakes like Australia are going to show up. The trick is I've made the mistake and now I need to find ways to minimise the damage. I've also early on tried Trading and had high expense active investments which for me at least were also mistakes. In view of the above I'd be interested to know what you would do differently both now and in FIRE? It could really help me and also might help many readers on similar journeys. That's why I'm here. To try and build a community of like minded people where as a collective group we do much better than as individuals. I have suggested in this post that if I was in your situation I would be aligning my portfolio more towards growth - with a view to a gradual change of emphasis to take up to 5 years-more towards growth and income round about FIRE. The state of the markets would clearly be very relevant. I have reduced exposure to FTSE and a large number of it's constituents -within the context of what I consider a widely diversified portfolio.This is a very broad generalisation - but I think many FTSE 100 company long term prospects for growing their earnings are less good than their share prices suggest . Many have large cash piles as they have failed to invest for the long term future - something that will come back to haunt them . They will be able to support and maintain dividends for some time by eating into their cash pile , or share buy-backs and M&A activity ( NB M&A is economically a zero-sum game ) But if their earnings are not growing sufficiently - they will be punished in their share price as they will either have to reduce dividends or stop them growing so much , and profits will disappoint expectations. 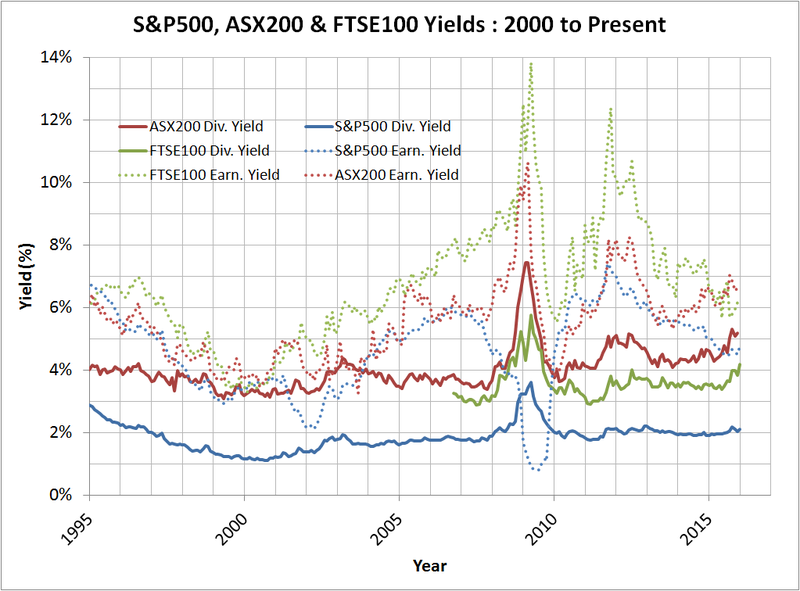 Many high yielding FTSE 100 companies have been seen almost as bond substitutes - with bond income so low. So - they are overbought in my opinion - and likely to suffer when interest rates rise and bond and cash returns start to make a bit more sense. Sadly - I think your biggest financial mistake is irretrievable. You have not bought a house in UK. Our house was valued 18 months ago as the same as in 2007 - in between suffering an approx.30% loss . Now - that would have been a good time to buy a house ( in the dip )- enjoy prolonged low mortgage rates- saving rent and building up equity in your house . It would also have exposed you to the realities of owning a house - as I do feel you have unrealistically low expectations about the costs of maintaining , running , adapting and improving your home - and also the cost of moving home again at a later date ( you could easily end up having bought 3 , 4 or even 5 different properties at different times - to meet your then current needs )by the time of your eventual demise ( hopefully even 50/60 years into the future ! ) What I mean is possibly 2/ 3 or 4 moves. I admit that overrall these costs as well as running costs of owning a home will be less in a country where property values are much lower than in the UK . But NB - there are still parts of the UK where property IS still cheap . I hope you enjoy your Christmas - and keep posting. As always thanks for your thoughtful and challenging comments. You have reduced exposure to the FTSE. Is that just the FTSE100 or UK Equities generally? Would you share where you have deployed that capital? I fear you are right (at least for now) regarding buying a house. I say the next piece as a person who is/was living in London for both the adventure and so that I could maximise savings. At no time did we ever intend to be here forever. Additionally, when I started on this journey I couldn't afford a London property, when I could afford one they seemed well over priced and since then they've gone to the moon. Instead I went for a diversified portfolio which I've slowly built up which is miles behind the London house price boom (and many many miles behind those that are heavily leveraged on their London properties). That said I think we can still do very well in the UK. Current thinking is away from the South East (as you allude to) where we'd like to buy some land and build a modest energy efficient oak framed home. Initial work suggests that should cost somewhere around £350k but a lot more work to do. That would be my first UK FIRE project. That said as a family we are still more leaning to more sunny Mediterranean climes as the Pro's & Con's (and there are plenty of Con's) seem more suited to us. Here we'd just buy after renting for a good period. My first project there would be become fluent in the language asap. I guess what I'm saying here is that a Med move is not at all financially motivated. Re home running costs. At this time I've come to an annual long run average spend of £3,500 to maintain a 120-130m^2 home. Clay tile roof and lime rendered exterior. Understand will need home/contents insurance which would be extra on top. Do you think that to low? Wishing you a very happy Christmas also. I'll be sure to keep posting as I can see the FIRE finish line and then the adventure really does begin as I (we) grapple with the next phase of my (and my families) life. Now - investments . I am in a very different situation to you financially being 66 and having retired 3.5 years ago and in receipt of a superannuation ( ie non-investment performance linked) pension which is CPI linked. We own our own house with no mortgage - our children x2 were privately educated and I have spent large sums!! over the years on providing horses for my daughters as it was their passion. All but 5% of my stockbroker managed portfolio is in collectives ( my choice ) - the 5% is in Fuller Smith and Turner - this would be a very much higher %'age if we had not sold them gradually to fund the above and to diversify.They were originally inherited by my wife. The object is Growth@ Medium to High risk and I have no tracker funds currently and have never owned an etf. So - I am fully exposed to fund charges (TER's), performance fees, dealing charges at £ 35 per sale or purchase and an overall 1% pa ( includes VAT ) of total value ( which includes cash ! ). Most interesting, thanks. Comparing your approach and mine shows us coming at things very differently. On the housing front. Having lived in a small London flat for many years, which has been more than adequate for our needs, even a 120m^2 home is going to feel positively palatial. If we then make it energy efficient our lighting/heating needs should be very modest. I'm also happy to do a lot of things myself (did a lot of DIY when still living at home and really enjoyed it, of course might change as we age) so will clean windows, general cleaning, gardening and general maintenance myself. So I think your running costs are far higher than we'll ever need. That said I appreciate what you're saying so will do more research before going for it. On the investment front. You're packing an actively managed, equity heavy portfolio (equity heavy as you have that lovely CPI linked pension I guess?) which is frankly absolutely kicking my backside. For 2013 I managed 5.3%, 2014 5.4% and 2015 YTD I estimate I'm -3.0%. You nicely demonstrate how we're all so different in our approaches. I always wondered why you had such a low proportion in US stocks. Home bias is great and all that, but the enormousness (and general resilience) of the US market is not something to be shied away from in my opinion. For a UK investor I am still yet to find a better book than Time Hale's Smarter Investing. It is this book that really formed the basis of my whole portfolio. Within this he talks about Tier 1 equities and then states 'The FTSE All Share is the index of choice for the rational investor'. - 25% Tier 1 UK equities. I'm currently a bit lighter than this as I'm also build home purchase cash. Without the cash I'd be at 27% or so. - 5% Small Cap Equities. I don't currently have any but it's my next step after I build a bit more FTSE250. - 5% Value Equities. Rightly or wrongly this is my HYP. - 5% Emerging Market Equities. Check. - 5% Hedge fund of funds. Too expensive and I don't see the performance promised. I just see a lot of wealthy Hedge Fund Managers. - 5% International. I'm at 15% net of my cash position of which I want 40% to US, 40% to Europe and 20% to Japan. That's the story behind how I'm so underweight the US. I'd be interested to hear about your US position and your general International position? Interesting post/comments as ever RIT. I was reading Nick Train's comment this past week regarding the relative outperformance of the US market compared to the FTSE which he puts down to the tech giants such as Google, Netflix, Facebook, Amazon etc which are trading at all time highs this year. Meanwhile we have a large proportion of energy and commodity companies which has depressed the performance of the FTSE. Like Ruby, I like the simple approach of Lars Kroijer and this year I have been moving a significant percentage of my portfolio into the likes of Vanguard LS - (it is my entry for weenie's monkey competition!). Seems to me a very simple solution to providing a low cost, globally diversified equity/bond portfolio which is auto rebalanced. OK, probably too much home bias with the 25% equity allocation of UK all share but that aside, possibly hard to beat for simplicity. Yes, the US market is overvalued but that could remain the case for some time. There's probably no such thing as a perfect portfolio allocation - if you are happy with it, then that's probably all that matters. Good to hear from you John. I'm yet to read Lars book so maybe that's something to download as a Christmas read. I've also been actively following your exploits as you transfer from an investment trust / individual shares kind of guy to a passive one fund convert. It's been most interesting and I'll be continuing to follow with interest. My strategies have changed over the years, having been into emerging markets very heavily in the 2000s and then selling everything in 2007 for a tidy profit. Nowadays (in my SIPP) I only have a few % in emerging markets. My allocations vary according to portfolio. For my ISA, I'm building up my shares in UK dividend paying value stocks, but I'm maintaining my Vanguard US tracker in there too, but only to a very small %, because the purpose of the account it more for regular and reliable cashflow. The same for p2p, which I hope to start increasing from the new year. I think you may have mentioned in a previous article about using p2p as a 1-2 year cashflow machine, which is sort of similar to what I'm doing there. For my SIPP, I've moved to quite a conservative base portfolio, built on Ray Dalio's model (see 'Investing for Your Mother-in-Law' in http://theresvalue.co.uk/general-life-update/ - But on top of this very stable base, I then add an allocation to small-caps, which for the new year will be a Russell 2000 ETF/tracker. This will bring my overall stocks allocation up towards 60% and that will largely be US (some from the Vanguard LS, rest from the Russell). I just feel that the US market is that much more powerful than putting the focus on the FTSE as Tim Hale does. Yes, the FTSE gains much of its income from global operations, but the FTSE 100 in particular has too great a weighting to a narrow range of companies e.g. mining and financial. The American markets are not only broader, but the number of old-time long-term stable dividend payers (and growers) is just that much larger than anything we've got here, that I'd rather maximise those opportunities for growth and income. I found Lars Kroijer's book to be a much simpler and, in many way's a more logical, explanation and strategy. Let the weight of money decide how you should be allocated to the world's markets, set and forget. I was going to have only one equity holding, Vanguard World but did not want all my eggs in the Vanguard basket so some in ishares World and ishares Emerging Markets so have two essentially identical holdings.No need to agonise over allocations and it all gets rebalanced automatically. Add something to world smaller companies if one likes and then add bonds in whatever proportion you want. Personally, I think you need a rethink because while you may think your approach is a passive and mechanical one (sorry if I am putting words in your mouth) it is, in my humble, not really anything of the sort and you are taking some huge contrarian bets - allocating 4.5% to the US, for example when the world's investors are allocating over 50%. Similarly, over 25% to the UK when it amounts to under 8% of the world market cap.This is what has killed your returns. That's not to say it won't make them in future years but unless you have a special insight that will likely be down to luck more than skill! I'm even finding my portfolio a bit a chore and if I can overcome my aversion to having everything with Vanguard think Life Strategy is the way to go! Many thanks for the alternative view Ruby. Weightings based on global market cap does have a good logic to it. The comments to this post nicely demonstrate how there are about as many 'correct' portfolio's as there are investors. Do you have any investment return figures that you could share for your approach? Only been going since April and and drip feeding money in....but dire so far! Its actually just the equity bit of a 60/40 equity/bond so overall portfolio is a smidge down but too early to say. Sleeping well enough though and feel I have all the bases covered. Please do share results as you go. I'm also not far off a 60/40 allocation albeit a very different one to yourself. Would be great to compare notes going forwards. Vanguard All World - years to 30/11/13, 14, 15 were +23.6%, +8.1% and -2.4%. It may be a benchmark you think worth following, if only out of interest, since it shows at a glance how your approach compares with the set and forget route and you may decide coming over to the indolent side is easier all round. Australia is the Lucky Country. She'll come right, mate. She'll be apples. It will be interesting to watch Australia over the coming months/years as it is probably one of the most addicted to mining countries out there (no data to prove just hypothesis) with circa 9% of GDP coming from mining. The high salaries afforded by either living in inhospitable country or 'flying in, flying out' also seems to have fuelled an almighty house price boom (of course Aus is not the only country with that problem). XE back up to $2.12 : £1.00 as I type this. I've been diversifying the last 2 years from FTSE 100, but I've been going into Europe, Japan and in the last few months Emerging. I've kept out of USA because it seemed over-valued on CAPE, I'm not able to judge much else. Having diversified, I read Hale's book, where he points out that not only are the various markets quite well correlated, you take on exchange rate risk for overseas markets, which unlike many risks is not rewarded by a greater return. I'd not thought of that before, bother. I worked in the US for 2 years when it was $2:£1, but brought the money back when it was $1.6:£1, result, perhaps I should have left it there, but I didn't like doing US tax returns, and then UK ones with the funny foreign income. My US exposure is 2% in a US pension scheme, which I'll leave forever. I've also been wary of the US because I don't like the taxing structure of US domiciled ETFs. I'm not sure if there is a S&P tracker ETF which is UK or Ireland/Luxembourg domiciled to avoid that. Two things to think about: exchange rates fluctuations and the fact that US market cap is 60% of world market. 1. I think it's simplistic to apply CAPE across a huge financial discontinuity like 2008 which has clearly resulted in a totally different investing environment since then. 2. The lower valuations of the FTSE and ASX reflect the higher risk and also, obviously, the state of the commodities and energy markets. The US economy is stronger, well supplied with raw materials and energy, with stable governance and relatively low taxation, and is only around 14% connected to the world economy in terms of GDP. Small wonder that this is seen as a lower risk economy that is valued more highly. As the S&P has stood still for a year, I think it quite likely that it will again move ahead in 2016. Unless your reading is that the US is about to enter stagnation or recession.